The simple and clean lines of this Colonial bed is a look that would blend with a traditional or contemporary home decor. This solid wood bed has an elegant look with its arched headboard and beautifully turned posts with finial tops. 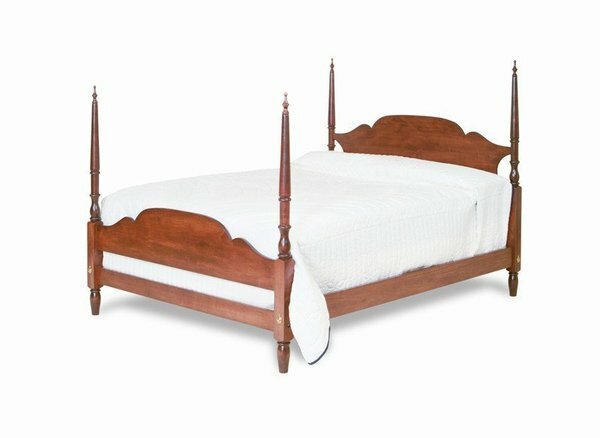 Our Colonial beds are handcrafted for each customer by an Old Order Amish woodworker with the best quality construction techniques. This Amish bed is a reproduction of an Early American bed that is sure to retain its value over the years. This bed is sure to become the centerpiece in your bedroom. Choose from a twin, full, queen, king or California king size. We are proud to work with our expert Amish craftsman who put their blood, sweat and tears into making beautiful heirloom quality furniture like this solid wood bed. Old construction methods are used that have been proven to withstand the test of time. The Colonial Arch Top Poster Bed is handmade with the best techniques known to woodworkers. Customize this bed to fit you bedroom and decor. This bed takes between 6 to 12 weeks to be built. Please call to speak to one of our Amish furniture specialists with questions or ordering assistance on our bedroom furniture at 1-866-272-6773. Well, we followed the instructions and the bed is complete. Everything worked out really well and the bed looks beautiful. My husband had no trouble following the instructions on the diagram. We are very happy with the bed. This is the first time I have ordered anything so large on-line but it all went really well. No problems at all! We would like to thank you for all your help. It was a pleasure doing business with you and DutchCrafters. The item we ordered was a bed and fits in nicely with our other maple furniture. I would recommend Dutch Crafters to family and friends.